Grand Marshall, Tony Dorsett of the Dallas Cowboys at the McAllen Holiday Parade at McAllen Veterans Memorial Stadium on Saturday Dec.2,2017, in McAllen. 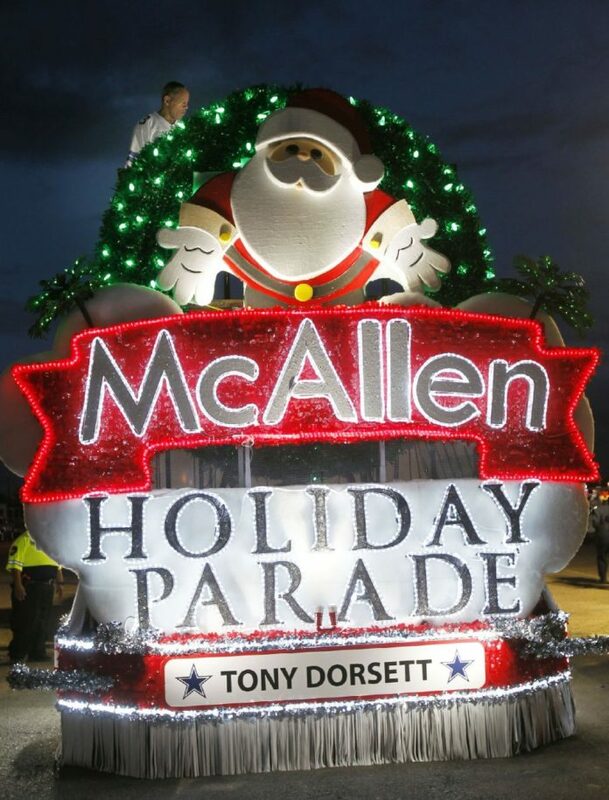 McALLEN — Enthusiastic families traveled from all over the Rio Grande Valley on Saturday to take in the annual McAllen Holiday Parade and festivities at the Municipal Park. The parade route started at Veterans Memorial stadium and traveled down Bicentennial Boulevard ending at Business Highway 83. The one-and-a-half-mile illuminated parade was led by former Dallas Cowboy Tony Dorsett, the grand marshal of the parade and followed with floats carrying celebrity guests such as Dallas Cowboys players, including Tony Hill, DeMarcus “Tank” Lawrence and Ryan Switzer, the Dallas Cowboys cheerleaders and their mascot Rowdy. Other celebrity highlights included television personalities like Ana Maria Polo from Telemundo, Karina Banda and Julian Gil from Univision, Guillermo Rodriguez from “Jimmy Kimmel Live” and Rio Grande Valley natives and now child actors Manelly Zepeda and Noel Carabaza. McAllen resident Vincent Garza sat with his wife, Esmer, on a blanket on the grass with their children including their granddaughter waiting patiently for the annual event to begin. They’ve been attending the parade regularly because it’s an event they get to enjoy together. “We like everything, we like the floats, the music, the lights; it’s very entertaining,” he added. “I think it brings a lot of families together, to come see it as a family,” Esmer Garza added. Within the crowds watching the parade was a group of friends who attend South Texas College and University of Texas Rio Grande Valley who wanted to see the floats and what was new this year. “I’ve been coming every year, since the first one,” a member of the group said. The friends all liked different floats. “The Telemundo float because that’s the only celebrity I’ve seen and recognized,” Jesus Elizondo said. After the holiday parade wrapped up, families were invited to Christmas in the Park. The park festivities included a carnival and musical acts. The festivities also included the Dallas Cowboys Hall of Fame Museum and official pro shop, the Oscar Mayer Wiener Mobile and the World Renowned Budweiser Clydesdales.